Antony Todd is doing things his own way and keeping things real. Having nailed down those all-important windsurfing fundamentals Toddy chose to forge his own path and plumped for the area windsurfing that REALLY flicked his switch – speed and slalom. Happy to cover the miles and hit up spots on a forecast, shell out on the correct equipment (without help from sponsors) Ant is on the water during any good blow and right in the mix with his on water performance. We caught up with Mr T to see what drew him to speed windsurfing and what it takes to knock down that 50 knot barrier. I first discovered windsurfing back in 2006-2007 when I owned a motor boat which I used to moor at Chichester Marina. When we used take the boat out in to the Solent we’d see the guys out sailing, blasting around and getting some big air. 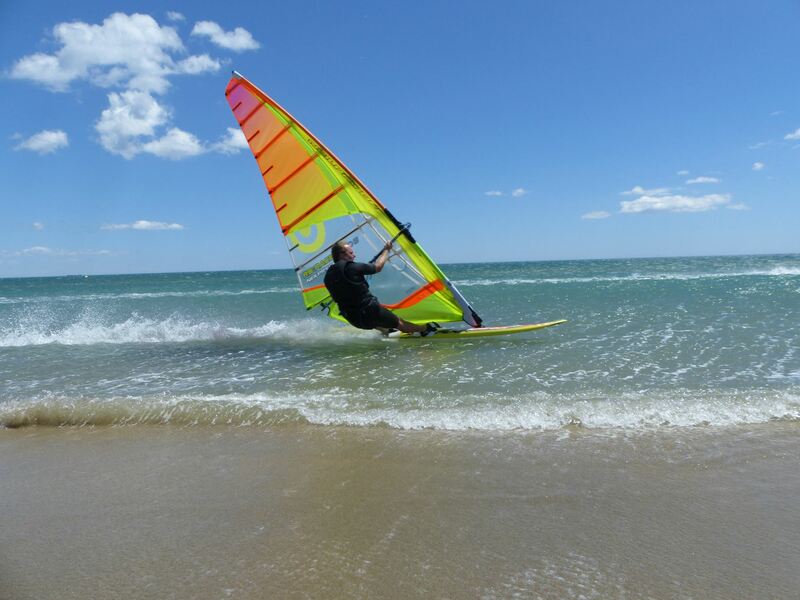 I thought that windsurfing looked cool and decided to go and learn. My first windsurf board was a Fanatic freestyle wave 85 which I partnered with North Ice sails. I have spent a lot of time on the water and have sailed at some great windsurfing locations in the UK and across Europe. I have been fortunate enough to have become friends and sail with many top level windsurfers. Sailing with those guys only helps you improve and push your limits. Early on I went on a few windsurf clinics with Peter Hart and that helped me a lot. But I think I progressed when I joined a south coast slalom group. I used to spend many hours out on the water, tuning kit and doing endless gybes. I also used to do the BSA National Slalom events which helped me with progression no end. UK Slalom Champ James Dinsmore gave me lots of help, as did Allan Cross, organiser of the National Watersports Festival. There are so many great guys out there who I respect and that have given me inspiration to improve and go faster. I would say James Dinsmore (as already mentioned), Ross Williams, Ian Richards, Pete Young, Hans Kreisel, Jacques Van Der Hout and Antoine Albeau have all contributed. I was introduced to slalom by James Dinsmore. Ian Richards and Mike George then showed me the ways of speed sailing back in 2013. They said I should come along to Southend with them on a good forecast. The first time I sailed there I was on a 90L board and 5.6m race sail. The speeds I reached were around 38 knots. That was it! I was hooked and don’t think I’ve missed a session there since. My favourite spot in the UK is Southend. The Ray is a great spot to sail. I like the whole vibe and it’s very picturesque. Southend on a good day is one of the fastest spots for speed. It works in a variety of wind directions, from S–W, and has super flat water. I also think that Roa Island is another good spot that has potential to be really fast on a good forecast. Overseas my favourite location is La Franqui in the south of France. It takes me around 14 hrs to drive there from my house in Swindon, Wiltshire. I do about six or seven trips a year with Ian Richards, Sam Hunt and Jason Grafton. LF attracts Europe’s top level speed and slalom sailors all pushing for GPS rankings. With good Tramontana winds, which blow offshore, it’s a perfect flat water location for speed sailing and tuning your kit. There is always a great crowd. Plenty of smiling faces and everyone wanting to improve on their PB’s and pushing each other to go faster. Camping is cheap – around 6 Euro a night – and it’s a very chilled and relaxed atmosphere. I’m always happy to go home and back to work for a break though. Three to four full on days of speed sailing is exhausting! Currently I’m using JP boards, Neil Pryde Evo 8 sails with Z and Hurricane fins. I’ve found that JP and Neil Pryde are what I need. You can just rig to specifications and go sail. Just have a look at the top 10 GPS ranking and PWA slalom rankings to see JP and NP are top of both. I just follow the leaders! If that kit is working for those guys it’s more than good enough for me.I get pretty busy with work and family commitments but I also try and make time to get out and sail. I currently have my own business as a self-employed electrician. I do not have any sponsors and fund all my kit purchases and travel myself. I’ve never really considered the whole sponsorship thing. I’m always playing around, tuning and tweaking my kit on and off the water. Even when it’s working well I want to maximise performance and make the set up feel as comfortable as possible. I’ve spent many of hours in my garden rigging sails, trying different masts in my sails and rubbing down the bottom of my boards to try and get more speed. I have also spent many hours scrutinising Luderitz videos looking at all the fast guy’s stances and working out what I need to do on the water. There aren’t any special tips that have worked for me. I would say wearing a weight jacket helps and time on the water has been key. Sailing with the same combo on a regular basis and getting dialled with my kit is another way I’ve gotten faster and more efficient. Kit development is only getting better. Boards are getting faster and more controllable and sails are getting lighter with bigger wind ranges and more stability. My full quiver is comprised of Neil Pryde Evo 8 5.2-7.0m race sails. They deliver awesome amounts of power, control and are lock stock stable in big winds. My personal best at the moment is 49.74 knots with a peak 45.35 knots across a 10 sec average which I achieved in 2015. So my goals moving forward would be to get a 50 knot peak and 46 knot average. I would like to improve my GPS top 10 ranking from 10th. It’s very close. I’ll be keeping an eye out for the perfect storm this autumn/winter which should help. Within a short space of time I can be at most spots in the UK, Holland and France. Windsurfing is a great sport and I would encourage anyone to try it. There are many reasons to try it. It’s great exercise and not expensive compared to other disciplines. You can pick up kit really cheap nowadays and there are no age limits. Windsurfing is very social and you end up with some great friends. Likewise anybody can get into speed or slalom. Windsurfing isn’t elitist – anyone can get involved. I have done some wave sailing in the past and can pull a few shapes but I have not been out on wave kit for a while now. I would love to get back into it but getting time to fit everything in is tricky. The freestyle guys do nail sick moves and it looks very impressive. That said I think I’ll leave that to the youngsters. I’m mainly focused on speed sailing nowadays. I have dabbled with SUP in the past but only to work on my fitness. When not sailing I keep active by hitting the gym, running and Yoga. The UK has some great speed and slalom sailors that do well in competitions and for sure we can compare with any global windsurfing nation. We have some good locations in the UK for training but tides can cause a headache. I would like to do some events overseas next year. Maybe something like Mondial Du Vent, Dunkerbeck Speed Challenge, Defi Wind or Weymouth Speed Week. We’ll see.